Even though this is a skin and hair care blog, the holidays are fast approaching – the time of (making and) giving gifts! 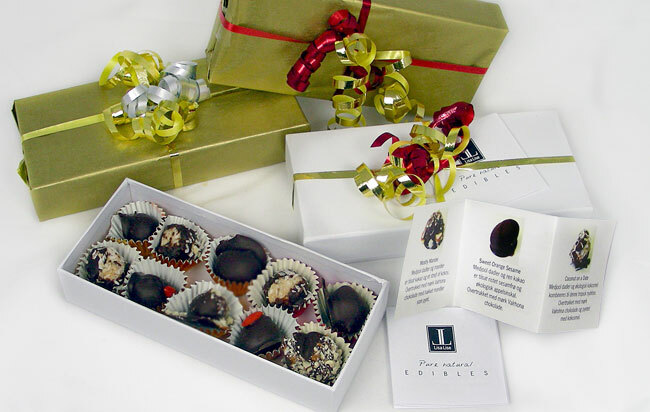 Above is a peek at the 2012 Christmas edition of LisaLise Pure Natural Edibles. I got a little fancy with the packaging this year, and thought I'd share it with you. Want to make your own? These are not only easier to make than you might think, they're downright good for you. Read on and I'll show you how. What you see above is healthy, vegan-friendly raw food candy with no added sugar or sweeteners. The best part: they pass the 'I hate healthy food' test every time. Even though 'healthy' and 'candy' doesn't usually go together, these tasty treats are rich, decadent and sinfully delicious. I dare you to make them and not agree with me! 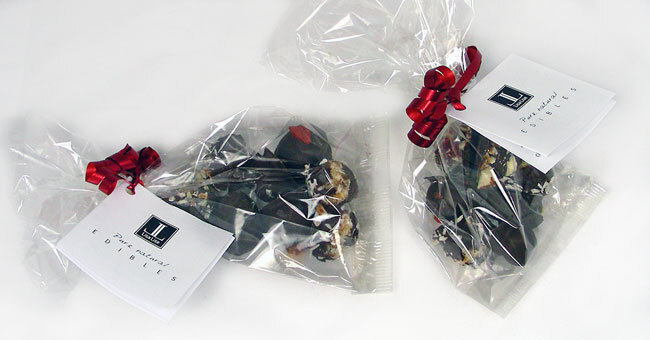 There are 4 variations pictured above – each covered/dipped in organic 72% dark chocolate. The secret: don't skimp on the quality of the ingredients and you will have a sure-fire hit every time. Split into however many portions you want to make tastes, then add any extras you may fancy to each portion. I soaked goji berries in rum for one of the flavor variations, added chopped almonds for another, made a roasted sesame seed with orange combo, and the fourth flavor shown above is a straight-up coconut/date combo. I've made these candies many times and almost always experiment with the flavors. Try adding exciting and unexpected things such as licorice powder (this was quite a hit with my family). If you want to go all out, photograph each flavor and make a little booklet with the ingredients and a fun description for each flavor. The recipient will not only appreciate the thought, but anyone with special dietary needs will be fully informed as to what they're tasting. If you can't find boxes, package in cellophane bags with a pretty bow. Thanks Stephanie, they really are easy to make. I kind of figured it out from reading the ingredients list of some raw food candy I tried once and found out it was a snap to make (at half the price too) . Promise to let me know how it goes, ok? Hello Lise, you know I am going to so make these. One question, I am still fairly a virgin in the kitchen when you say coconut do you mean coconut milk? Sorry for delay lol been super concentrating on blog stuff. Okay, will see if I can get some shredded, if not may have to wait till after my birthday, my friend has given me a chocolate cake recipe so may do that for now. Hmmm.. its not something I have seen in the baking section in supermarkets, we have coconut cream, oil and dessicated. May have to look in a specialist shop. I do believe dessicated coconut is what you're looking for-- ripped up coconut in itsy bitsy pieces.. right?